Song Bang-song. Korean Music. — Jimoondang Publishing Company, 2000. — ISBN 89-88095-13-8. The Concise Garland Encyclopedia of World Music. — Taylor& Francis, 2013. — ISBN 9781136095948. The Ancient Arts of Korea. — Ministry of Culture and Information, 1970. Yi Hye-Gu, Provine R.C. 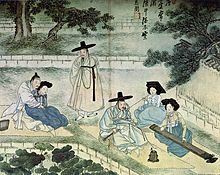 Essays on Traditional Korean Music. — Royal Asiatic Society, Korea Branch, 1981. Kim Hŭng-gyu, Fouser R. Understanding Korean Literature. — M.E. Sharpe, 1997. — (An Eastgate book). — ISBN 9781563247736.